Discussion in 'Cables, Power, Tweaks, Speakers, Accessories (DBT-Free Forum)' started by kskwerl, Apr 20, 2012.
first, is the build and looks of it, the quality of wire that was used is magnificent. and I need to search for your email. VERY nice! I love the therium too! 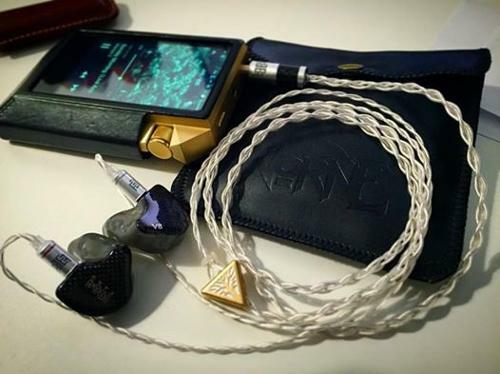 I got a 4core for my Fidue a83's with a custom order with TRRS balanced, yet cancelled my order of the LHlabs Geekwave xdf256...so I sent the cable back to Trevor to be reterminated with an eidolic Rhodium TRS silver carbon. I can't wait to get it back. That is a fantastic cable for sure. My A83's never sounded so good. I love how you got a splitter to match your DAP. excellent! I am absolutely loving my Therium 4 Wire with my Alclair RSM Quads, and in the next week or so I should have a pair of Alclair's new audiophile reference ciems in for review. It truly is one if not the best CIEM cable available! Thanks Trevor! My Therium Cables arrived today. Can't wait to test it the first chance I get this weekend. I believe the wait will be worth it! I've been waiting almost three months for my Draug order to come in. Is that normal for Norne? Yea wait times vary depending on when you ordered. In my past experiences it is always a longer wait if I ordered around Black Friday or anytime Trevor runs promotion offers. I also recall a longer wait when he transitioned from Norse to Norne. A wise man once said: "Your mind is simply not in sync with your heart...resistance is futile. Bottom line - if you're happy, buy. If you're sad, buy. If you're undecided, buy. If you're angry, buy. If you're bored, buy." Email being sent for you right now. Will email you update Youth. and spend 18 hours in the workshop. is imminent. But again please do not hesitate to shoot me an email for update. YW, thanks for being patient on the wait, look forward to your thoughts. Black Friday is a big part of what caused a pile up on the cable highway, for sure. Of course everyday I am working toward the goal of dropping lead time.